Some might say adaptive reuse is for the birds—in which case, San Francisco–based Kuth Ranieri Architects might happen to agree. 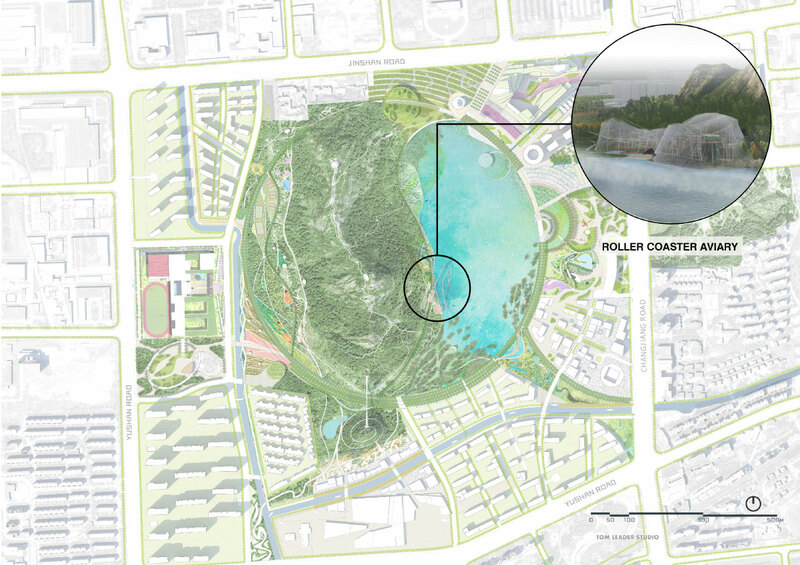 The office is currently working on an unexpected adaptive-reuse project in Suzhou, China—just outside Shanghai—with fellow Bay Area landscape architects TLS Landscape Architecture, with the aim of repurposing an aged amusement park at the foot of the iconic Lion Mountain into a central green for a new, technology-focused residential hub. For the Shishan Park project, TLS has designed a district-wide master plan focused on a new circular promenade surrounding the old central lake that once anchored the forgotten fun park. The development is carved into ten subdistricts, each anchored by iconic pavilions—also designed by Kuth Ranieri—and recreational spaces “capitalizing on the site’s natural and man-made lakes as well as the mountain’s historic significance and beauty,” according to the architects. 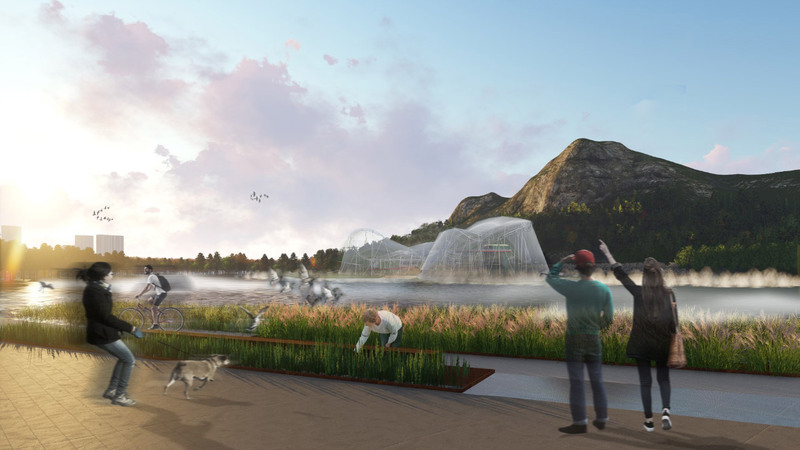 Overall, TLS’s designs highlight 18 “poetic scenes” that visually connect occupants to the existing lake, nature zones, and views of the five distinct mountaintops that can be seen from the site. At the heart of the new urban area is the disused amusement park and its original metallic roller coaster, which Kuth Ranieri plans to convert into a new, 160,000-square-foot visual and functional center for the 182-acre development. 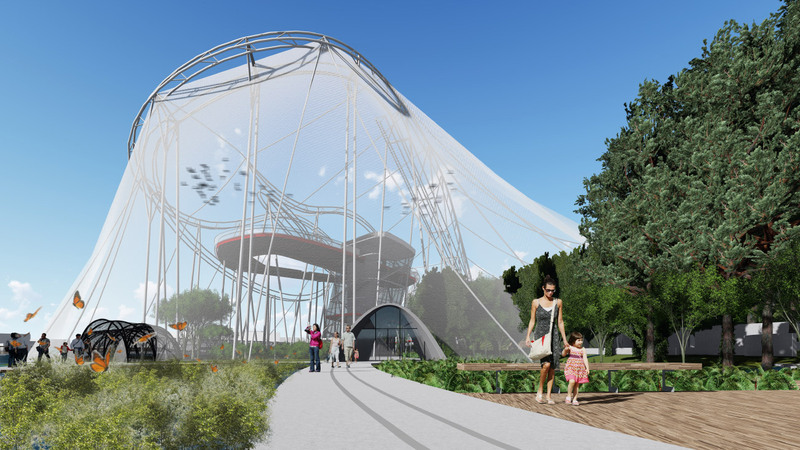 Utilizing stainless steel mesh netting to create the outermost enclosure and wooden decking and steel platforms for new occupiable promenades, Kuth Ranieri reenvisions the dilapidated roller coaster as a superscaled aviary. 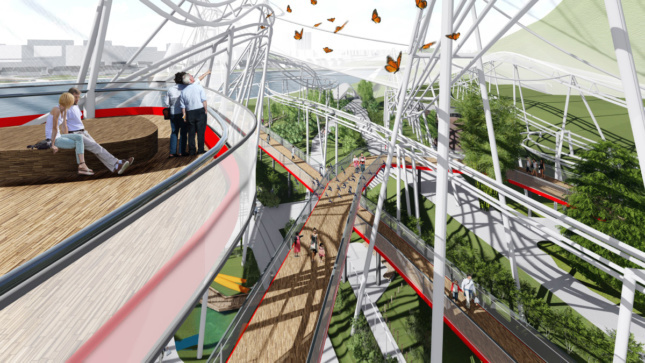 The plan includes a circuitous “infinity walk” that takes occupants up and through the reused roller-coaster structure to perches above the treetops furnished with viewing platforms and an expansive sky deck. The complex can be entered from any one of three access points framed by glass-wrapped concrete parabolic arches that extend into the aviary as covered walkways. Within, the complex will also contain a ten-story circulation tower that can bring visitors up to the highest observation levels. Here, a wide staircase containing landings generous enough to host public programming will wrap the elevator core. 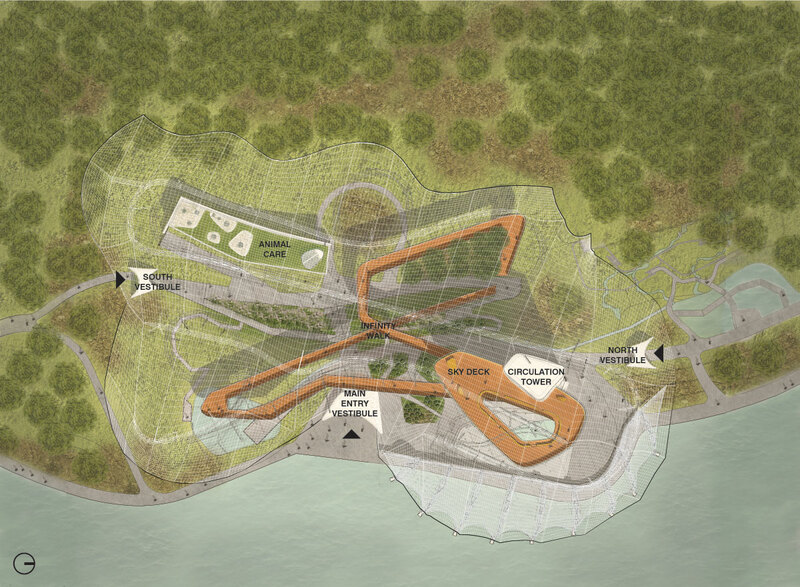 The complex will also include a green roof–topped animal care facility. The metallic enclosure surrounding the aviary is inspired by traditional Chinese ink paintings and, more specifically, by representations of Lion Mountain in such artworks. The cascading, rounded geometries of the canopy are designed to evoke “a feeling of layered misty mountains,” according to Kuth Ranieri.